Like many of you, Amy and I had the pleasure recently of attending a graduation ceremony for one of our children. Joshua, who completed his degree at the University of Pennsylvania in December, returned from his new home in Tel Aviv to participate in commencement exercises with his class. The two days we spent at Penn were an emotionally fulfilling and filled with pride and delight at our son’s accomplishments, a feeling that I’m certain many of you have experienced as well. These are moments to cherish, true “she-hecheyanu” moments that call forth from us expressions of gratitude and delight at life’s blessings. We are so pleased to see our children grow and thrive and to see them move forward in life. Still, transitions like graduations can sometimes be quietly bittersweet. While we take delight in seeing our children grow and mature, we know that as they do we must begin to let go. When our children are young, we know that we must begin to teach them to make their own decisions and to live on independently. At some point in life, we recognize that our children are moving swiftly toward adulthood. Change of any type is both good and challenging. In order to be fully human, we must embrace change, both in ourselves and in those we love. And change can be challenging, as it requires us to give up that which is familiar and comfortable and replace it with something new. As we watch our children grow and change, we should be reassured that, while part of us may find it hard to let go, their growth brings forth a new, positive and enriching person of whom we can be proud. It may be challenging at times to embrace change, but it brings with it new promise and potential. When asked what Josh is doing now that he has graduated from college, we proudly say that he has moved to Tel Aviv and is working for Google as a computer programmer. Upon hearing that he has moved across the world from our home in New Jersey, some people say, “You must be devastated that your son has moved so far away.” I instinctively reply, “Quite the contrary.” Children are meant to move forward from their family home to find themselves in the world. Not only am I proud that Josh is expressing his Zionist identity by making aliyah, I fully accept that his life journey will take him where he wants to go, not where I want him to go. That is as it should be. I want to wish Mazal Tov to all those in the Oheb Shalom family who are celebrating a graduation this month, whether from nursery school, college, or somewhere in between. 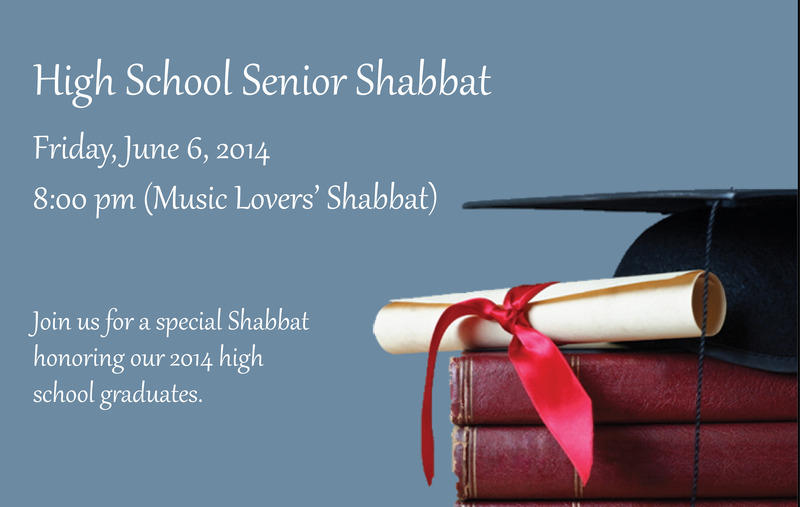 I encourage you to attend our annual High School Senior Shabbat on Friday, June 6 at 8:00 PM. High School Senior Shabbat is a special evening on which we honor our graduating High School seniors and celebrate all they have done, and I know you will be pleased to attend. This entry was posted in Cyber Letter and tagged children, graduates, graduation, transition. Bookmark the permalink.